TheBlueGuerilla: CF Take Over Leicester Sq. LEICESTER SQUARE, LONDON was swamped with members of the Tory Youth Wing this past Saturday as they celebrated the birthday of popular Braintree Councillor & Eastern Conservative Future (CF) Leader Stephen Canning, TBG can reveal. TBG can also confirm attendees and guests at London's Ruby Blue bar included CF Chairman Oliver Cooper and election guru Peter Botting. 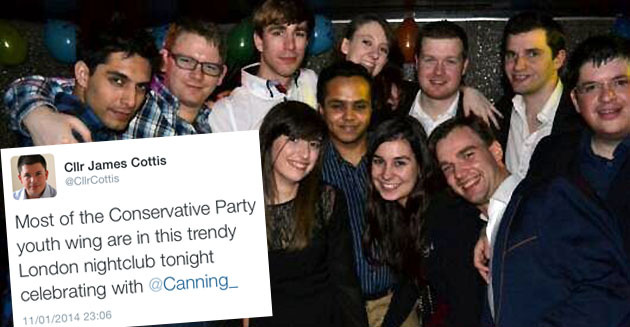 According to one partygoer, Cllr James Cottis - "Most of the Conservative Party youth wing are in this trendy London nightclub tonight celebrating with Canning"
Lame. Get a life and stop hanging out with that creepy 40 year-old, Cllr Cottis! Kudos to Canning's PA EVT for organising it! Can 12 people 'swamp' Leicester Square? Chairman Walker, what a hottie. Let' be honest, NO WHERE near as awesome as Miss J Rah's birthday party the week before or her Halloween soiree. 12 people doesn't make a party. @Darling - Try telling that to Ukip. Also, I'm not sure that counts as most of the Conservative party youth wing. Otherwise we have a serious membership problem on our hands!